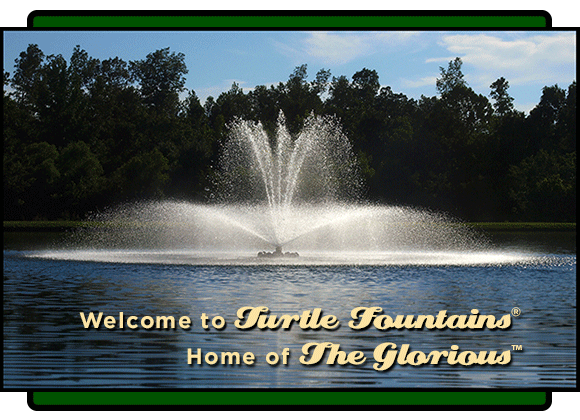 A Turtle Fountains™ floating fountain delivers beautiful sights and sounds and will make your pond or lake come alive. Imagine how much healthier and attactive your garden, pond or lake can be. Our floating fountains will provide a healthier environment for your marine life. The constant flow of water will aerate your lake or pond which minimizes algae, unwanted vegetation and mosquitoes. Turtle Fountains manufactured floating fountains are ideal for creating water features in lakes and small ponds at Golf Courses, Apartment Complexes, Cemetaries, Industrial Centers, City Parks and Private Residences. © Copyright 2016, Turtle Fountains LLC., All Rights Reserved.